This four-bay NAS is the ideal solution for multimedia enthusiasts looking to store and stream large music and video collections. 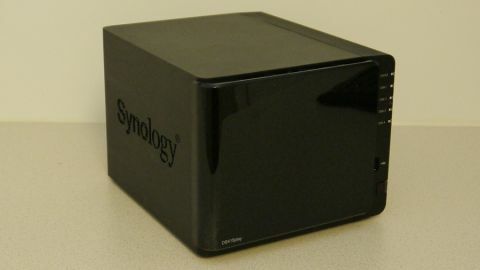 Housed in the same black plastic case as the DiskStation DS414, the new DS415Play looks like another variant of Synology's popular small business NAS. Look a little closer, however, and you find it has more in common with the DS214play, the company's first DLNA-certified media centre product, offering the same 1080p full HD transcoding capabilities, but with four rather than just two disk bays for users with large multimedia collections. First impressions of the DS415play are of a very light desktop device lacking the quality feel of other four-bay storage appliances such as the QNAP TS-470, for example. Install some disks, however, and it takes on a much weightier feel and, in fact, build quality turns out to be pretty good – well up to the usual Synology standards. It's a smart little box too, clearly aimed at the home market with a shiny removable door in front of the drive bays. This is secured by simply pushing into place rather than being hinged as on other appliances, but then you don't have to access the disks that often so it shouldn't be an issue. We would, however, have liked some kind of physical lock to keep inquisitive fingers out, especially if positioned near to the TV, for example. Plastic carriers are provided to hold the disks with ingenious plastic strips that do away with the need for screws, at least if you opt for 3.5-inch drives. Go for 2.5-inch disks and screws are still needed. Either way the carriers simply slide in at the front, plus there's the usual external AC adapter to plug in at the back. Two fans are also to be found at the rear and these proved whisper quiet in operation, an important consideration on a box likely to be located in the living room. On the connectivity front you get a single Gigabit network port and three USB 2.0 ports, two at the back and one at the front. However, unlike the smaller DS214play there's no quick copy button to transfer files from a USB memory stick without having to first login to the NAS. There's no SD Card slot either, or eSATA ports, although you do get a couple of USB 3.0 ports at the back for fast backup, or possibly to share and stream data direct from external disks. The processor inside the DS415play is a dual-core Intel Atom clocked at 1.6GHz, the same as on the smaller DS214play, accompanied by 1GB of RAM. It's the Atom chip that provides the transcoding capabilities, although for a system with transcoding as a key selling point, it was surprising to find that we had to install extra software and enable transcoding as an option before we could make use of this ability. On the plus side this task proved relatively painless. Having gone through the cloud-based installation of Synology DiskStation Manager (DSM) we simply logged on via the browser-based front-end and downloaded the DLNA compatible Media Station app from the Synology Package Centre. This can handle most of the common encoding formats – all you have to do is add the appropriate file extensions to the list provided. With the Media Station package up and running we were then able to stream music and video to a PC running Windows Media Player and a Panasonic smart TV connected via Wi-Fi. Both gave impressive results with no discernible buffering, lag or lip-sync problems even with HD video. Of course, in addition to media streaming the DS415play is also a common or garden NAS that can be used to share data across a mix of Windows, Mac, Linux and mobile clients. The same highly functional DSM operating system used on all DiskStations is employed here, complete with Synology Hybrid RAID (SHR) technology that takes care of RAID setup for you and also allows for hassle-free expansion should extra space be required. Using the latest 6TB disks maximum capacity is 24TB, but we installed our usual set of four 4TB WD RED drives which, after SHR overheads gave us just over 11TB of usable space. With four disks available to it the DS415play has more RAID options than its two-bay sibling plus hot swap disk support without powering down. Moreover, although far from the fastest kid on the NAS block, performance is acceptable for a home device. The Atom processor and single Gigabit network port clearly set a ceiling on what's possible, but using the ATTO Disk benchmark we still obtained a peak throughput of just over 117MB/sec reading data and slightly shy of 109MB/sec when writing. This translated into real world figures of around 60-80MB/sec when copying files back and forth, depending on file size and the capabilities of the client hardware. That's a good set of results for this kind of NAS with the added bonus of video transcoding on the fly.